Anyone who lives in a colder climate is well-accustomed to seeing rock salt in the winter time. However, not many people realize the significant damage salt can cause on concrete and asphalt pavements. In fact, using rock salt as a deicing agent can lead to defoliation of plant life and post a threat to pets and children who get it on their skin or ingest it. Thankfully, there are safer alternatives that you can use to remove ice from your driveway! Sand provides extra traction on the driveway so even though it’s not technically melting the ice, it is reducing the possibility of you or your vehicle slipping. Plus, using sand reduces the negative impact of salt. Be proactive! Don’t wait until the snow freezes over or gets compacted. Shovel early and utilize the heat from the sun to make the process easier. For particularly stubborn patches, boil some hot water and pour it over the icy area. Only use a little at a time and use it in coordination with a shovel. When done carefully, this can be a great way to remove stubborn ice. Snow-melt mats can be used as a hassle-free choice on walkways, entryways, sidewalks, etc. Plus, they are easy to store in the off season! 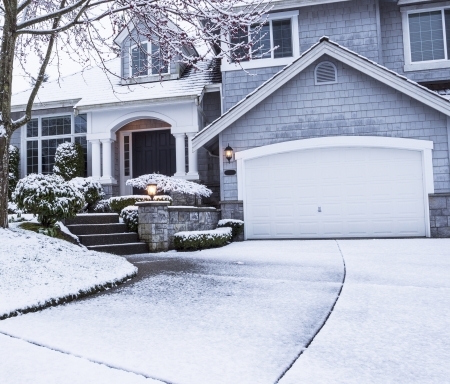 Looking to combat ice this winter and keep your driveway safe? Templin Concrete Construction is ready to help with our expert snowplowing services, keeping your driveway clear and protected from the elements. If it seems that you’ve already weathered some damage, take a look through our concrete repair services as well and give us a call at 612-388-1945!